PARK CITY BASE STUDIO**SUMMER HEADQUARTERS! WALK OUT THE DOOR TO THE SLOPES! GREAT FOR SUMMER STAY. MANY TRAILS FOR HIKING OR BIKING DIRECTLY OUT BACK DOOR!! Step off the slopes and into your cozy studio/condo, right on Park City Mountain Resort. Our condo has been updated with freshly painted walls & cabinets, more lights added, new shower door & best yet a new Sealy BEAUTYREST MATTRESS & the best in pullout sleeper sofa beds with NO BARS. The sleeper sofa is like sleeping on a real bed without the saggy mattress & bars keeping you up all night. 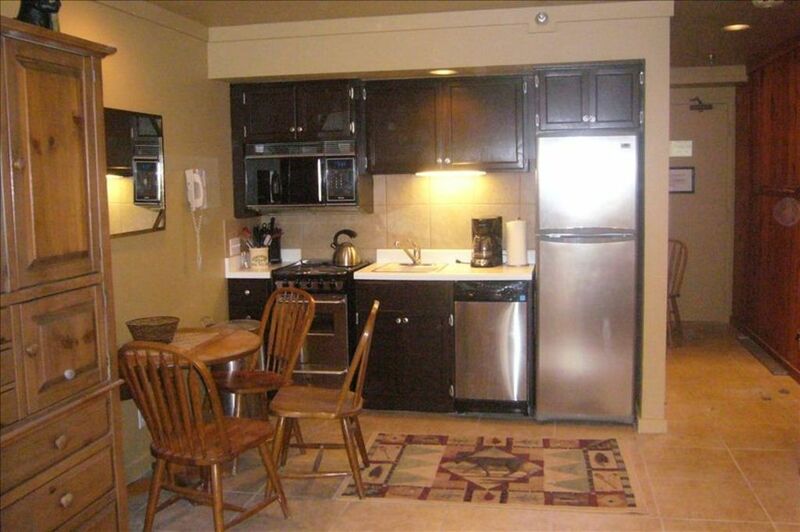 The condo offers all the conveniences a couple or small family could need. You will sleep like an angel in the Beautyrest mattress queen size Murphy bed for 2, along with a pull-out queen NO BAR sofa sleeper for 2 more. There is full STUDIO kitchen with a dining table, coffee maker, dishwasher, microwave, oven & stove, as well as a refrigerator/freezer. The entertainment center has a new flat screen TV, as well as DVD/CD players. There is plenty of storage space with a full size dresser, 1 closet, and a ski rack. Our gas log fireplace warms you after a long day of skiing, and the balcony provides a nice outdoor space to watch all the action on the mountain plaza below. Park City Mountain resort accommodates kids of all ages, with a year-round Alpine roller coaster, a seasonal ice skating rink, and other seasonal kid-themed rides and amenities on-site. In winter, you can take a horse-drawn sleigh ride to a mountain-top restaurant (this books fast!). No need to ever leave the mountain. But if you'd like to explore Park City, we have a city bus that will take you all over town (Main Street, Deer Valley, The Canyons, etc.) all day, every day - for FREE. The pick-up point is right outside of our complex. We have free covered parking, access to indoor/outdoor swimming pool, indoor Jacuzzi right down the hall, access to fitness center/gym, convenient coin-operated washer & dryer and ice machine. FREE WIFI, TOO. Our local property manager is a long-time Park City resident who can offer convenient trouble-shooting and can recommend local venues to help plan your dream vacation. We hope you create lifelong memories here at our ski-in/ski-out studio/condo at Park City Mountain Resort! Also ask about the discounted airport shuttle service and grocery valet service!! Free local bus service, walk to restaurants, shopping, entertainment. Only complaint was the inability to turn heat down or even off. Place was warm and had to open sliding glass door just a crack so I could sleep comfortably. Otherwise everything was fine. Great place for two and right in the center of the base with lifts steps away. Bed was comfortable. Holly was very kind to take care of my luggage after checkout on my last day while I was on the mountain. Highly recommended. Definitely stay again next ski trip!!! The owner was great to work with and had everything lined up for us. You can't get much closer to the slopes! We enjoyed the 3rd floor hot tub for the view of the slopes. Everything is in the condo that you need even some basic condiments and such. The Murphy bed was comfortable (didn't use pullout couch bed). If you are a light sleeper, you might want some earplugs as you can hear activity from other units. All in all great place and we would stay again! This condo is conveniently located just a couple of minutes walk from the Payday, Crescent and First Time lifts. It is also a very short walk to the ice rink and all shops on the lower level. Although not new, this unit was clean, cute and cozy with all needed kitchen cooking items. This studio has a soft comfortable Murphy bed and a pull out couch. The unit was easy to keep warm. The electric fireplace always worked with just a flick of a switch. The balcony provides a lookout over some of the plaza level shops and a pleasant view of a couple of ski runs to provide enough feedback to decide which goggle lens to choose for the day. There was an ample supply of very soft large towels. The staff provided plenty of tissue, toilet paper, shampoo and conditioner. The hot tub and ice machine are just a few doors down the hall. I would definitely rent again! Great location and nice place!! This condo is in a great location with a very short walk to the slopes and restaurants and bars. Bus will also pick up and drop off right in front of condo. The condo itself is nice and was clean and fit the needs of our stay. It would be very cramped with more than 2 people. Owners were very quick to respond to any need that we had. The building that the condo is in isn’t the most ideal for bringing luggage and groceries into as the elevators aren’t the most convienant. We would definantly stay here again for the location. On-site ice skating and a cool roller coaster in winter, jumbo bounce houses and other kid activities in summer. Security deposit of $400 needed prior to arrival.